Montgomery County council members are set to consider a bill that will prevent the county from asking prospective employees to provide pay stubs from their last job. Montgomery County Council members are set to consider a bill that will prevent the county from asking prospective employees to provide pay stubs from their last job. All nine council members, who have signed on to sponsor the bill, say it’s a move toward pay equity in the county workforce. At-Large Councilmember Evan Glass said he noticed the problem when he started the hiring process on his own staff. Once he took office and started hiring, Glass said the county’s human resources department notified him that they would need pay stubs of job applicants. “I discovered that managers in the county have the discretion to rely on pay stubs to set pay grades, to determine salaries,” he said. Glass wants to eliminate the practice. 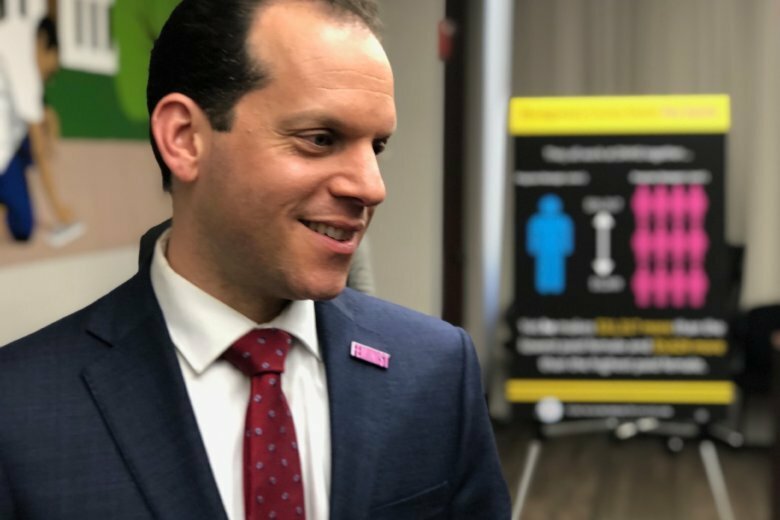 “When pay history is used to determine future salary, individuals get stuck in a cycle of being undervalued, and that cycle disproportionately affects women,” he said. Glass cited statistics showing that, at the state level, women earn 79 cents to every man’s dollar. For women of color, the rate is even lower: 69 cents for African-American women and 47 cents for Hispanic women. “Who would have thought that here in progressive Montgomery County, we would be dealing with this issue of pay equity? But here we are,” Glass said. Council President Nancy Navarro, who has served on the council since 2009, was asked why the issue hadn’t come up before. “In my personal experience, none of my prospective employees had expressed any concern, nor was it ever mentioned that pay stubs were demanded,” she said. Navarro added that she welcomes the initiative kicked off by her new colleague on the council. Glass said as he dug deeper, he saw what he called “horrifying” examples of wage disparity. In the Health and Human Services Department, Glass said he found that one man made more than all 12 women who work in the same department. “And, compared to the highest-paid woman, he still makes $5,500 more than her. That is not fair and that is not right,” Glass said. In the Department of Transportation, Glass said he found that among similar management positions, a woman made less than all four of her male counterparts, despite having been on the job longer than the male employees. “We are thrilled that the Montgomery County Council is taking up this common-sense, high-impact step to help close the wage gap,” said Ruth Martin, vice president of workplace justice programs at Moms Rising. “It is a simple step, but it is a vitally important one because it means that women who are paid less because of their gender or their race will not automatically carry that disadvantage from one job to another throughout their careers,” Martin said. Drew cited other states where similar laws have been enacted. D.C. has also enacted policies against asking for pay history to determine future salaries. When asked if the legislation would result in the county having to adjust wages, and where that money would come from, Glass said, “We don’t know what this ultimately will mean” in terms of costing a given dollar amount to the county. WTOP’s Kate Ryan reported from Rockville, Maryland.